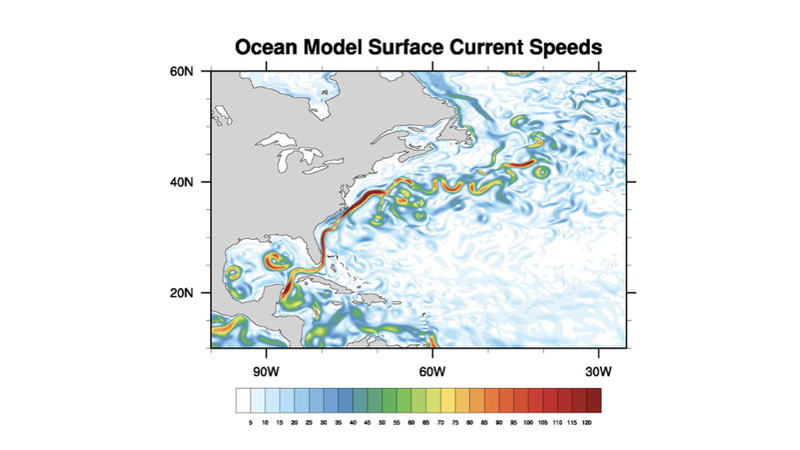 Surface currents speeds simulated by global climate model. Brighter colors correspond to stronger currents. MIAMI—University of Miami (UM) Professor Ben Kirtman received more than $650,000 in funding for his work to improve regional and global climate forecasting. Kirtman, who has been at the UM Rosenstiel School for over 10 years, is a professor of Atmospheric Sciences and director of the NOAA Cooperative Institute for Marine and Atmospheric Studies (CIMAS). A three-year grant from the Department of Energy for $350,819 (DE-SC0019433), titled “Decadal Prediction and Predictability of Extremes in Ocean Eddy Resolving Coupled Models,” will build upon Kirtman’s work as the science lead for the North American Multi-Model Ensemble (NMME), an unprecedented effort to improve seasonal operational predictions based on the leading North American climate models. The co-principal investigators of the project include: Robert J. Burgman from Florida International Universityand Kathy Pegion from George Mason University. A two-year grant from the National Oceanic and Atmospheric Administration (NOAA) totaling $299,831 (NOAA-OAR-CPO-2018-2005133), titled “Sensitivity of NMME Seasonal Predictions to Ocean Eddy Resolving Coupled Models,” will support research on improving the NMME prediction system by testing and demonstrating the utility of new or higher resolution models. The co-principal investigators of the project include: Leo Siqueira from the University of Miami, Robert J. Burgman from Florida International University and David G. DeWitt from NOAA. Kirtman is a climate modeler who uses complex Earth system models to investigate the predictability of the climate system on time scales from days to decades and to study the influence of tropical variability on mid-latitude predictability. He was one of the first to develop an El Niño/La Niña prediction system using sophisticated climate models and currently leads a team of government laboratory researchers, academicians, and operational climate forecasters in developing the North American Multi-Model Ensemble (NMME) prediction system. This new prediction system has been issuing forecasts in real-time since August 2011, and was instrumental in predicting continuing La Niña conditions in the tropical Pacific and the associated impact on climate around the globe. The NMME became an official NOAA operational system in May 2016.